Employment | Sioux Falls, SD | North American Truck & Trailer, Inc.
At North American Truck & Trailer, we pride ourselves on our energetic atmosphere. By joining our team you can experience a rewarding career with a leader in the truck industry. We are always looking for great candidates to join our team. Seeking experienced diesel technicians for truck repairs. Job seeker must have or contain the ability to obtain a class B or A CDL. Also, job seeker must furnish their own tools. The shop is open 7:00 A.M.-6:00 P.M. and 8:00 A.M. to Noon on Saturdays. The shop team rotates Saturdays. The job includes a complete benefit package, and the pay will be according to experience. A pre-employment drug screen is required. Please send your resume to our address listed under "Locations". Seeking experienced Body Shop Mechanics. Job Seeker must have 12 months of experiance or equivilant schooling. The shop is open 7:00 A.M.-330pm Monday- Friday with occational Saturdays. The job includes a complete benefit package, and the pay will be according to experience. A pre-employment drug screen is required. Please send your resume to our address listed uner "Locations". Seeking experienced diesel technicians for truck repairs. Job seeker must have or contain the ability to obtain a class B or A CDL. Also, job seeker must furnish their own tools. The shop is open 7:30 A.M. to Midnight and 7:00 A.M. to Noon on Saturdays. The shop team rotates Saturdays. The job includes a complete benefit package, and the pay will be according to experience. A pre-employment drug screen is required. Please send your resume to our address listed under "Locations". Seeking experienced diesel tenhnicians for truck repairs. Job seeker must have or contain the ability to obtain a class B or A CDL. Also, job seeker must furnish their tools. The shop is open 7:30 A.M.-6:00 P.M. and 8:00 A.M. to Noon on Saturdays. The shop team rotates Saturdays. The job includes a complete benefit package, and the pay will be according to experience. A pre-employment drug screen is required. Please send your resume to our address listed under "Locations". Seeking experienced diesel technicians for truck repairs. Job seeker must have or contain the ability to obtain a class B or A CDL. Also, job seeker must furnish their own tools. The shop is open 7:30 A.M.-10:00 P.M. and 8:00 A.M. to 4:00 P.M on Saturdays. The shop team rotates Saturdays (usually each individual works every fifth Saturday). The job includes a complete benefit package, and the pay will be according to experience. A pre-employment drug screen is required. Please send your resume to our address listed under "Locations". Our Sioux Falls Leasing office is also currently looking for full time diesel mechanics. Volvo Trucks of Omaha is seeking a Parts Counter Salesperson. Must have positive attitude and be willing to learn. Experience with computers a must. Previous Sales experience is a bonus. Once trained work hours will varied day shifts, on call after hours and every other Saturday. To apply call Jeff Kerans 402-896-6900. Custom Truck Equipment: is looking for an Installer/Fabricator. We are looking for someone who can install truck accessories, ladder racks, toppers someone who can install lights on trucks some light electrical wiring. Need's to be able to custom fabricate items for certain projects and welding experience is needed. Will need to have his or her own tools (we provide all specialty tools). Position Provides: $13.00 - $18.00 an hour DOE. Monday - Friday hours 8:00AM - 5:00PM. No Weekends. Sioux Falls Truck & Trailer is looking to hire someone for our Warehouse/Shipping and Receiving position. Essential Duties and Responsibilities: Count, weigh, or measure items in incoming and outgoing shipments to verify information against bills of lading, invoices, orders, and other records. Determine method of shipment, utilizing knowledge of shipping procedures, routes, and rates. Ensure that outgoing shipments meet specifications. Maintain inventory of shipping material's and suppliers. Stamp, stencil, or glue identifying information and shipping instructions onto crates or containers. Unpack and examine incoming shipments, reject damaged item, record shortages , and correspond with shipper to rectify damages and shortages. Operate a Forklift Must be able to lift 100lbs occasionally Other duties given by supervisor Benefits available the 1st of the month following date of hire. Full Benefit Package. *$13.00. per hour, Monday - Friday 8:30AM - 5:30PM with every 5th Saturday 8:00AM - 12:00PM. Sioux Falls Kenworth is looking for a Detailer: Summary: Is responsible for cleaning, waxing, and polishing automobiles from both inside and outside. Essential Duties and Responsibilities: •Uses various types of cleaning equipment and solutions. •Details vehicle according to the customer’s specific instructions. •Shampoos carpets and upholstery. •Vacuums floors and seats. •Cleans out ashtrays and cup holders. •Cleans out ashtrays and cup holders. •Conditions vinyl and leather. •Cleans all trash, debris and dirt from the interior of the vehicle. •Uses special foams and detergents designed for specific types of microfibers. •Polishes the dashboard, steering wheel, trims and moldings inside the vehicle. •Cleans door frames and instrument panels. •Cleans all dirt, grease and tar from the exterior of the vehicle. •Reconditions the vehicle’s exterior. •Cleans all glass on the vehicle, inside and out, with the appropriate type of rag and cleaning solution. •Cleans all mirrors with the proper substance. •Steams the engine. •Removes grease from the engine and other parts under the hood. •Waxes and buffs vehicles after washing. •Uses air compressors and special equipment to dry the inside and outside surfaces. •Polishes the exterior chrome and all trim on the exterior of the vehicle using special chrome cleaners. •Applies chemicals to surfaces to protect against spots and stains. •Uses various paints, waxes and dyes to protect the leather parts of a vehicle’s interior. •Uses hoses and pumps for washing and rinsing vehicles. •Dries floor mats. •Cleans and polishes wheel rims and makes them sparkle. •Cleans the headlights, brake lights and taillights making them brighter. •Fixes minor scratches and chips with touch-up vehicle paint. •Manages the inventory of cleaning supplies. •Keeps records of customers and calls when it might be time for another detail. Position Provides: Monday - Friday 8:00AM - 5:00PM schedule Full Benefits: Available the 1st of the month following date of hire. If interested please contact Cheryl Rierson via phone @ (605) 575-2141 or via email cheryl.rierson@nattinc.com. 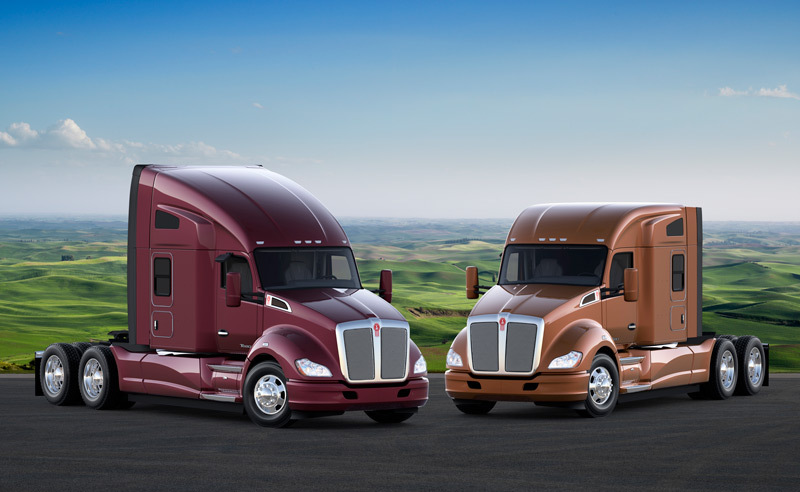 Sioux Falls Kenworth is looking for an experienced Body Shop Technician. Summary: Body work, prep work, paint/clear coat, and reassembling trucks. Essential Duties and Responsibilities: Remove upholstery, accessories, electrical and hydraulic window and seat operating equipment, and trim to gain access to vehicle body and fenders. Position dolly block against surface of dented area and beats opposite surface to remove dents. Fill depressions with body filler. Remove damaged fenders, panels, grills, bolts, and or weld replacement parts in position. File, grind, and sand repaired surfaces. Refinish repaired surface. Paint surfaces after preforming body repairs. Must posses their own basic tools. Have proper knowledge of SMC, fiberglass, plastic, plastic and sheet metal repair procedures. Must Not be Afraid of Heights (Requires work up to 15' on ladders at times). Position Provides: Monday - Friday 8:00AM - 5:00PM schedule Saturday as needed. Full Benefits: Available the 1st of the month following date of hire. If interested please contact Cheryl Rierson via phone @ (605) 575-2141 or via email cheryl.rierson@nattinc.com. Don't see a specific job listed but think you'd be a great asset to our team: Apply Now!